Over the last several years there’s been a minor cottage industry of rumors regarding celebrities who may or may not be going into space as tourists. Sometimes, sure enough, the rumors are true: after months of whispers about her potential interest in a spaceflight, Space Adventures announced in October that singer Sarah Brightman had signed up for a flight to the ISS, most likely in 2015. (Although more recently some Russian officials have raised doubts regarding whether she’ll actually fly.) For every one that does turn out to be true, though, there are many more that turn out to be false. A case in point: on Friday, the UK tabloid The Sun reported exclusively that actress Kate Winslet has received a free ticket on a Virgin Galactic flight as a wedding present. The report seemed to make some sense: her new husband, Ned Rockandroll, works at Virgin Galactic and is the nephew to Sir Richard Branson. 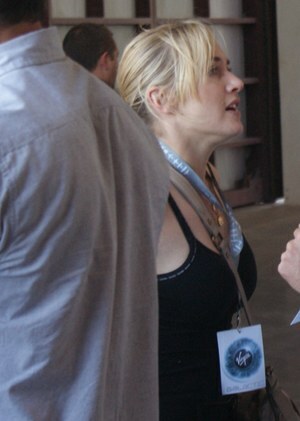 (Winslet accompanied Rocknroll to the dedication of Virgin Galactic’s terminal building at Spaceport America in New Mexico in October 2011.) And, The Sun claimed, the gift was also an expression for appreciation after Winslet helped save Branson’s mother from a fire at Branson’s Necker Island vacation home last year.